But thumb injuries don’t only happen to those who ski; it can happen to anyone while doing any number of activities that involve the hands. When the thumb gets rapidly pulled in a direction too far beyond its normal range of motion injuries to the ligaments surrounding the thumb can occur. The ulnar collateral ligament at the base of the thumb is usually the one that suffers the injury and is one of the most common reasons for thumb pain and swelling. The recovery time for a sprained thumb is typically four to six weeks unless the ligament is torn, in which case a more involved sprained thumb treatment, such as surgery, is necessary and will result in a much longer recovery time. What Causes a Sprained Thumb? A sprained thumb (also known as a jammed thumb) is often the result of a repetitive action that strains the ligaments in the thumb. A ligament is soft tissue that connects bones to other bones, creating a complete joint. Thumb sprains are common in sports such as volleyball, rugby, martial arts, skiing, and even basketball and Ultimate Frisbee to some extent. 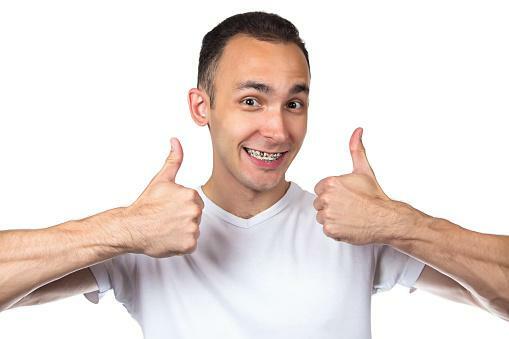 In these sports the thumb is often put into unnatural positions and the ligaments get extended out of their normal range, thus causing an injury. Hyperextension force, which makes the thumb go backwards beyond its normal limit of movement. Hyperflexion force, which makes the thumb go forwards beyond its normal limit of movement. Sometimes the thumb gets injured and we immediately assume the worst. The following are sprained thumb symptoms and signs that will help you determine if it’s just sore or truly sprained. You will feel an immediate jolt of pain in the thumb when it gets pulled. You will have difficulty writing, opening jars, turning a door handle, or even holding a glass. Bruising will likely occur around the base of the thumb. The joint will become red and inflamed. You will feel pain when the affected area is firmly touched. How Is a Sprained Thumb Diagnosed? Your doctor will first look at the injury and if they need a second opinion they may refer you to a specialist. Next, your doctor may do a stress test, in which they put pressure on the injured ligament. A thorough checkup by a physiotherapist is where you will land next in your path to diagnosis. They will be able to find out which joint has been injured and can determine a course of treatment. X-rays and an MRI might be called for if the physiotherapist suspects a fracture or thumb dislocation. To determine if the ulnar collateral ligament of the thumb is torn, the physiotherapist or doctor will move your thumb into different positions to establish how stable your thumb joint is. A thumb brace is used when the injury is more severe and the thumb and surrounding areas need to be completely immobilized. Before starting treatment, be sure that it’s been properly diagnosed by your doctor. Treatment for sprains, regardless of where they happen on the body, occurs in two stages. Stage one treatment is focused on reducing pain and swelling using the classic remedy known as RICE (rest, ice, compression, and elevation). This is done for the first 48 hours, and doesn’t need a doctor to do it. Implement this as soon as you suspect a sprain. Take an over-the-counter pain reliever if needed, and if you need something stronger your doctor will prescribe it once you see them. Stage two is the rehabilitation process. With physiotherapy, most people with a strained thumb can recover well, if not completely. It just takes time and dedication to whatever exercises are recommended. Here are a number of possible treatments for a sprained thumb that your doctor and/or physiotherapist will recommend. If there is a partially torn ligament, a cast or splint is used. It helps speed up the healing process by keeping the injured thumb in a constricted environment, to prevent use, overextension, and further injury. Thumb taping is another way to prevent the thumb from moving and potentially making the injury worse. Your doctor will show you how to wrap a sprained thumb. Your physiotherapist might suggest using Transcutaneous Electrical Nerve Stimulation (TENS). Small tabs are connected with wires to a machine and then placed on the injury site. A small amount of electricity is passed through the wires to your skin. The electrical current speeds up tissue healing, but can also help with pain management. Once the pain and swelling have gone down, the physiotherapist might do some soft tissue massage. It will promote healing of the injured ligament. If the ulnar collateral ligament is completely torn, surgery will be required to repair it. Once the splint/cast has come off and the thumb has healed enough, you will need to exercise it so it can relearn how to move again after being immobile for some time. Physiotherapy is important to build and strengthen the muscle, as it will likely have weakened while rehabilitating. Here are a few thumb exercises that should be performed once your doctor allows you to move your thumb again, and before resuming normal daily activities. Place your hand palm-side down on a flat surface. Attempt to move your thumb away from your palm, hold this position for five seconds, and then bring it back. Next, rest your hand on its side, with your thumb on your index finger, as though you were going to shake someone’s hand. Move your thumb sideways, hold for five seconds and then return to the starting position. The last movement is where you move your thumb across your palm to your pinky. Hold for five seconds and then return it to the starting position. Each exercise should be performed daily; two sets of 15 reps each. Pick up a small object such as a pencil or penny between your thumb and one of your other fingers. Do this one finger after another. Exert some pressure with your thumb onto the object when doing the exercise. Do this for five minutes a session. Squeeze a small, soft rubber ball with your fingers and thumb for five seconds before releasing. Do this a few times each day; two sets of 15 reps.
How Long Does it Take for a Sprained Thumb to Heal? To ease pain and swelling, you can place an ice pack on your thumb twice a day for two to three days after the injury. For the first three weeks after your injury, you will wear the splint or cast at all times. 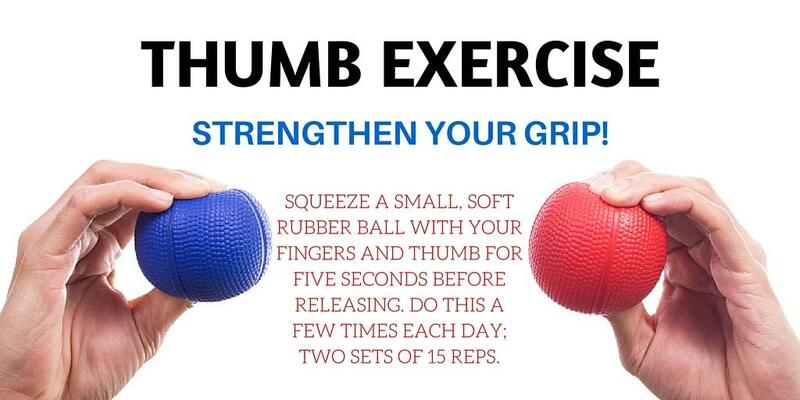 After that, you can take it off to do strengthening exercises for your thumb. A broken thumb will take longer to heal, sometimes it will be months before you regain the full range of motion and functionality. Don’t push it—you could break it again before it’s healed and that will result in an even longer recovery time. Early-onset arthritis in the thumb joint. Make sure to get a proper diagnosis and follow through with treatment to ensure future sprains don’t happen easily. When participating in heavy contact sports, or sports like volleyball where you use your fingers a lot, taping can be an effective method of prevention in keeping the thumb joint stabilized and preventing ulnar collateral ligament injuries. There are a few ways to tape a thumb, depending on how the joint was damaged. Ask your doctor or physiotherapist how to do it properly. If you don’t have to catch anything when playing sports, consider a thumb brace because it is more rigid and will offer better protection. “Sprained Thumb,” Ortho Info web site; http://orthoinfo.aaos.org/topic.cfm?topic=a00022, last accessed April 22, 2016. “Thumb Sprains,” American Society for Surgery of the Hand web site; http://www.assh.org/handcare/hand-arm-injuries/thumb-sprains, last accessed April 22, 2016.